U.S. President Donald Trump holds an Oval Office meeting on preparations for hurricane Florence at the White House in Washington, Sept. 11, 2018. U.S. President Donald Trump says emergency agencies are ready to cope with fast-arriving Hurricane Florence, even as he continues to praise his efforts last year on Puerto Rico, the island territory where Hurricane Maria killed nearly 3,000 people. Trump's latest praise for his handling of the government's recovery operations on the Caribbean island came hours after he told reporters his administration's response had been an "incredible, unsung success," a remark that comes as the island is still facing daunting cleanup and repairs from the September 20 storm. Puerto Rico's Governor Ricardo Rossello said, "Now is not the time to pass judgment; it is time to channel every effort to improve the lives of over 3 million Americans in Puerto Rico." "This was the worst natural disaster in our modern history," Rossello said. "Our basic infrastructure was devastated, thousands of our people lost their lives and many others still struggle." Rossello said the "historical relationship between Puerto Rico and Washington is unfair and un-American. It is certainly not a successful relationship." The San Juan mayor Trump attacked, Carmen Yulin Cruz, told CNN that the president's words Tuesday added "insult to injury," saying he has no idea what is going on there. She said Trump has "no empathy" for anything that doesn't make him look good. 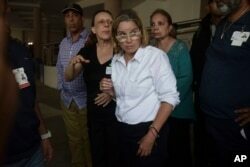 FILE - Mayor Carmen Yulin Cruz arrives at San Francisco hospital in Rio Piedras area of San Juan, Puerto Rico, Sept. 30, 2017, as about 35 patients were evacuated after the failure of an electrical plant. In his Oval Office at the White House, Trump said, "I actually think it was one of the best jobs that's ever been done with respect to what this is all about." He said the work by the Federal Emergency Management Agency and "law enforcement and everybody did working along with the governor in Puerto Rico, I think was tremendous." Rossello on Tuesday announced a new hurricane preparation plan, including two warehouses stocked with food and water, with two more set to open soon. Vulnerable populations are now officially listed, especially residents of nursing homes. 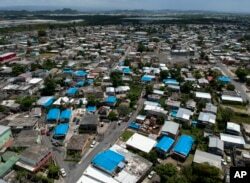 FILE - This June 18, 2018 photo shows an aerial view of the Amelia neighborhood in the municipality of Catano, east of San Juan, Puerto Rico. There are also new satellite communication systems, underground lines, and plans for 168 generators earmarked for the island's water and sewer companies. Parts of the island are still a wreck a year after the storm. Intermittent power outages are a problem and many people still have no roof on their home — just a blue tarp.